Falcon is a complete line of pro-level hardware with the features and conveniences needed by pros in the studio, on tour, or in the woodshed. 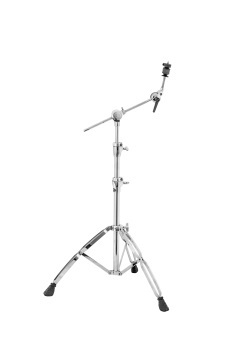 With memory markings on the boom tilter and a Super-Glide stepless cymbal tilter with 360 degree rotation ability, the boom stand is all about simplicity and convenience. -The single-point adjustment and position markings on the boom arm tilter make set-up easy and consistent from gig to gig. -The hideaway boom arm allow for compact storage and enable both straight and boomed set-up. -The Super-Glide stepless cymbal tilter rotates 360 degrees, allowing omni-directional cymbal angling without having to loosen the boom arm.